From Little Norway Park along the Lake Ontario waterfront, the skyline of the Toronto illuminates the area at night. 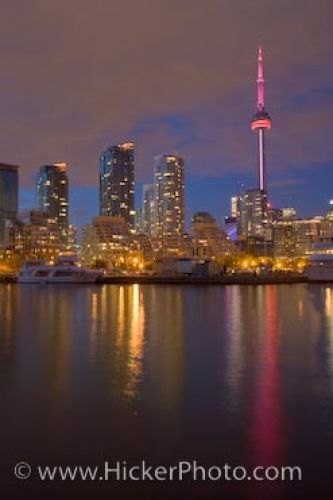 The lights in the city show their reflections in the calm water of Lake Ontario with the CN Tower lit up in pink hues towering above the rest of the buildings. Luxury yachts moor at the marina where passengers can enjoy the scenery of the skyline. For those who enjoy the city life, passengers aboard these yachts are within walking distance to the downtown core. Toronto City skyline seen at night from Little Norway Park at the Lake Ontario waterfront, Toronto, Ontario, Canada. Please let me show you more of my pictures from my "photo gallery: city pictures". Picture of the Toronto City skyline at night and their colorful reflections in Lake Ontario.